August 2nd has officially become our own personal holiday. We declared August 2nd to be National F**k with Roomie day. 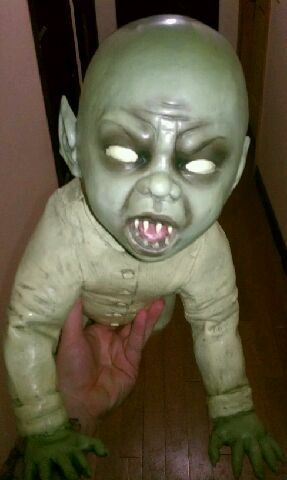 The day started out with a demon baby hanging from the ceiling outside his bedroom door. This little cutie was there to greet him and wish him a good morning before he left for work. This beautiful baby was suspended from the ceiling to greet Roomie right at face level. 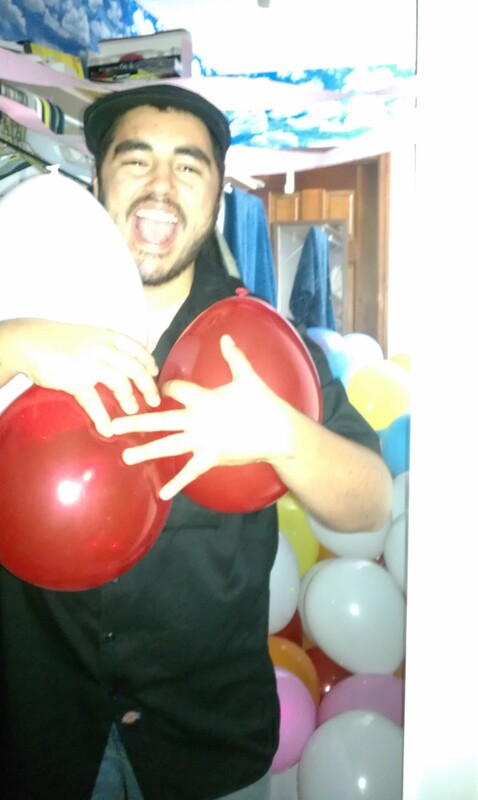 For some reason Matt’s brother and another friend also decided to celebrate National F**K with roomie day. This was not actually discussed between any of us. Everyone had their own plot and agenda for the day. 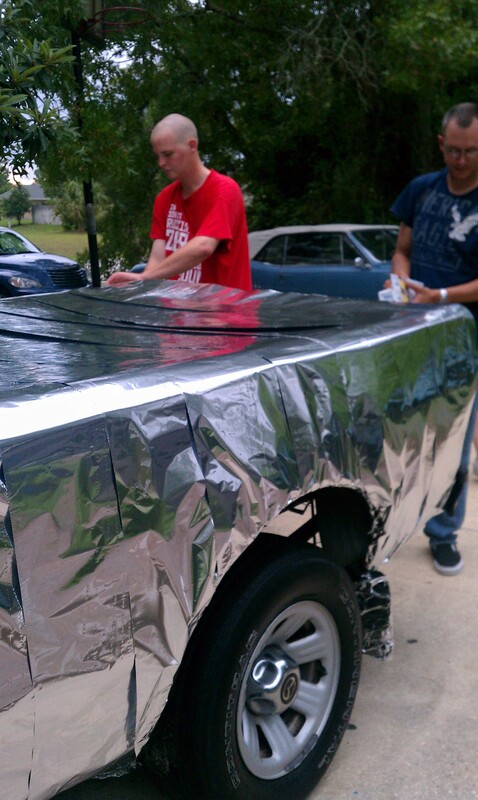 The boys came over in the afternoon while roomie was away at work with multiple rolls of tin foil. 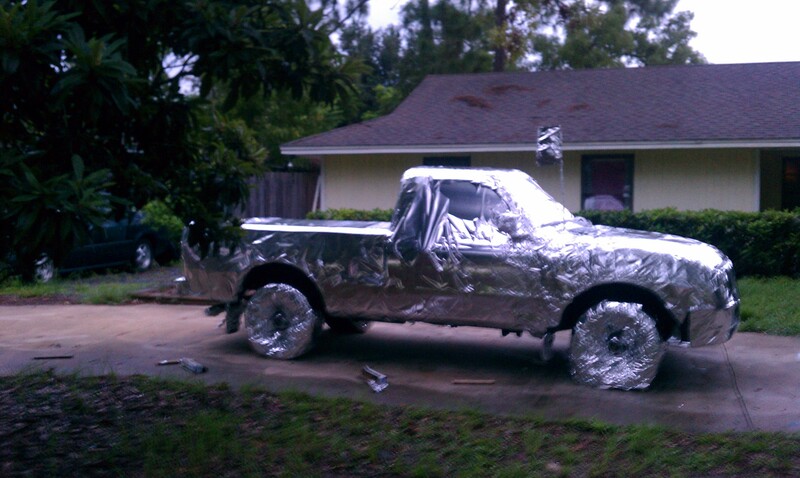 Their evil deed involved covering roomie’s entire new truck in tin foil. 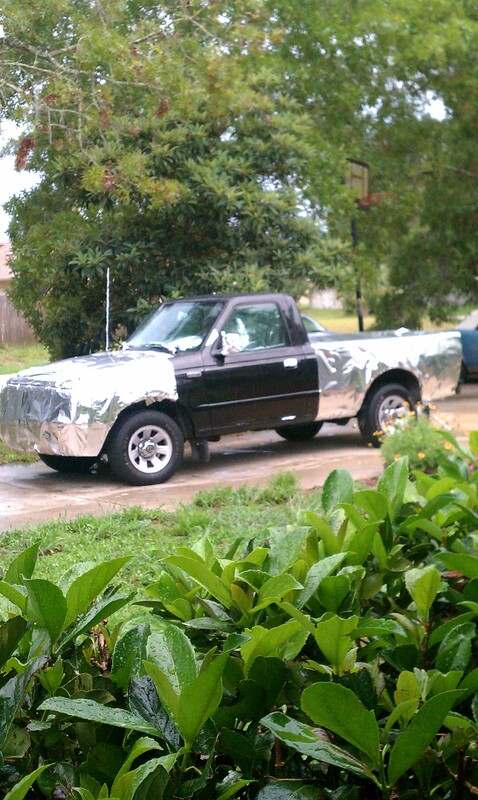 They covered every single piece of the inside and outside of his truck! Roomie has not even been able to register the truck yet! It was so neat looking that the neighbors also stopped by to take pictures. 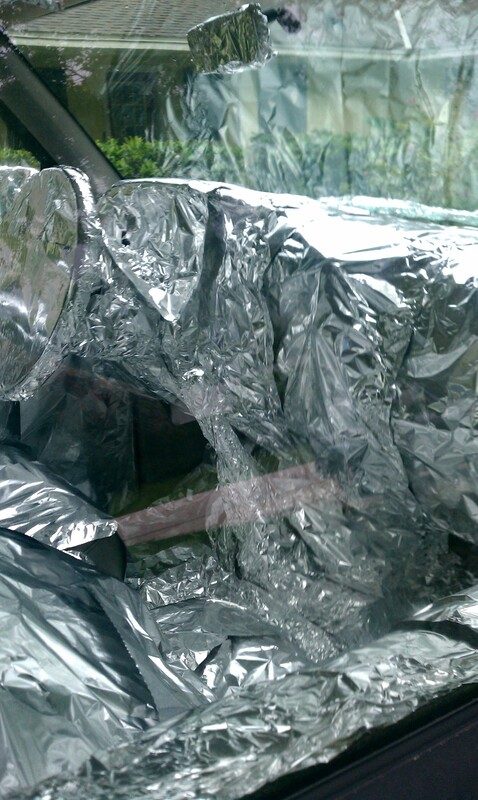 Now, any normal person might stop right there and think well a good morning scare and a tin foil truck is probably good enough. Any normal person would stop right there, kick up their feet to a job well done and wait for the victim to see their hard work. You however, step into the Griswold realm of reality and we do not “stop right there at a job well done”, oh no my friends! 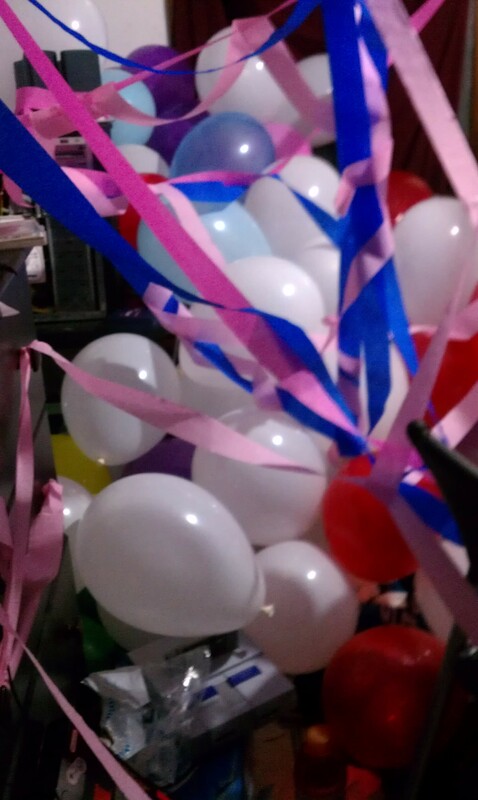 We proceeded to spend at least the next hour filling balloon after bloody balloon (roughly 800!) 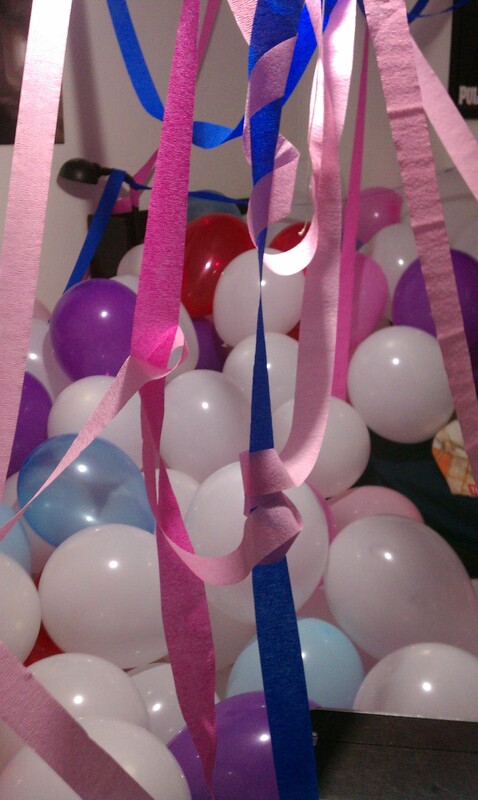 with the precious air from our lungs to fill as much of roomie’s bedroom as we could. 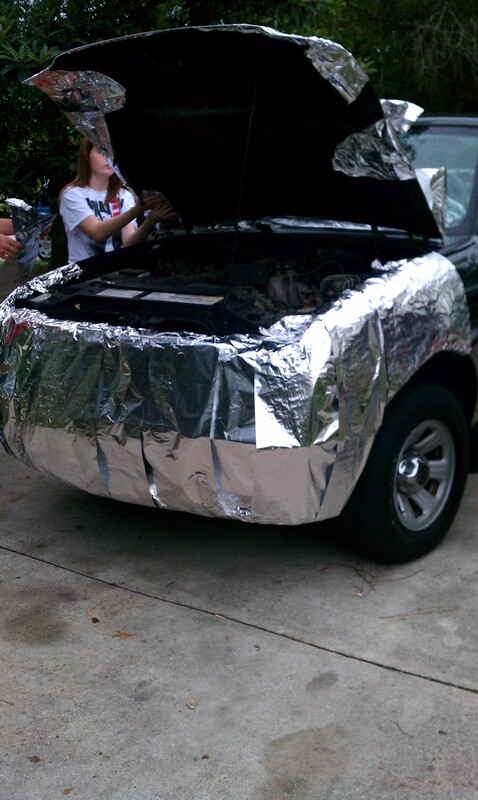 It was a team effort and was hard work. 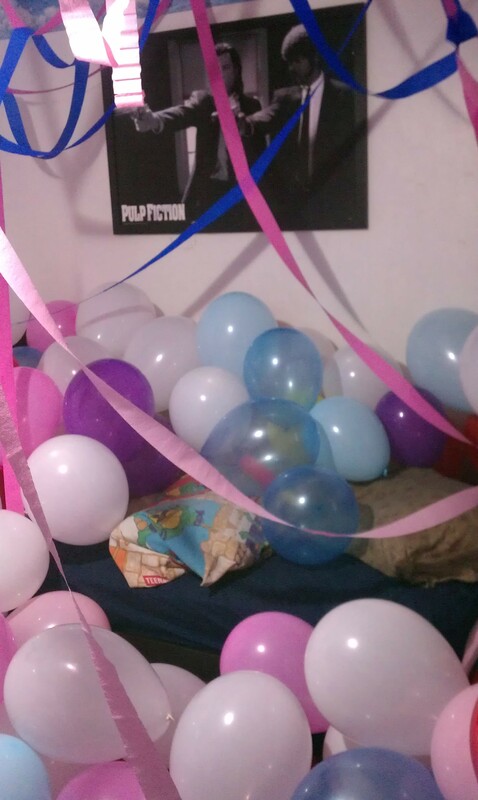 The teenager threw in her 2 cents as well with streamers o fun! The finished product was just glorious! To top it off, roomie had to potty in more ways than one and came home to find the fruits of our labor had completely blocked his bathroom door. 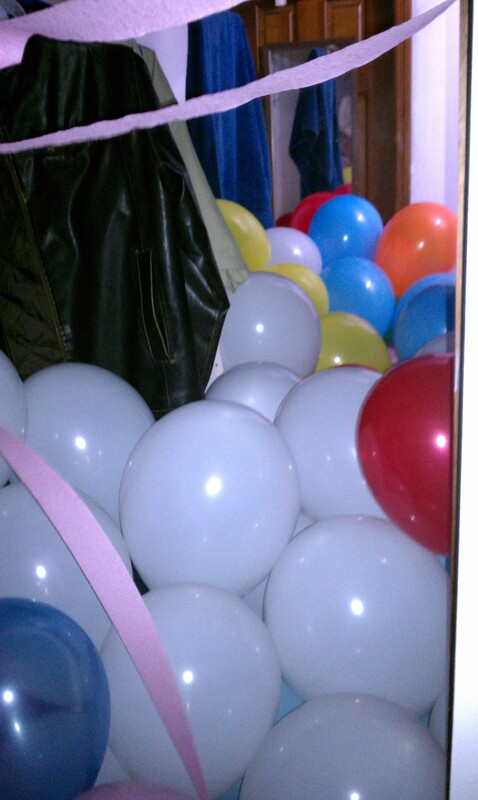 He literally disappeared into a sea of balloons before emerging again unsuccessful in his mission. 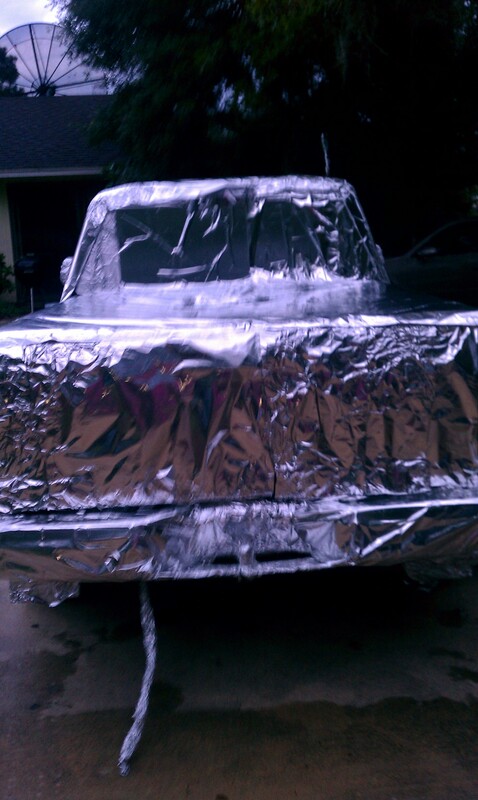 Roomie will be popping balloons and unwrapping his tin foil truck for days or maybe even weeks. I expected to hear giggles every time we hear a balloon pop and maybe even when we hear the tin foil song of our leftovers. I look forward to National F**k with roomie day of 2012. Time to start plotting now for bigger and better things! However we must keep in mind that F**k with Krystal, Matt, Teenager and all other friends & family day has in the past and may again arise at any point without warning. Ahh Griswold life is entertaining ! He looks much happier than he actually was! Do you have any special family holidays? Tell us about it. Share this blog post and follow us! I wish I knew this “holiday” existed, and I would’ve celebrated it as well. Usually every day is a “F*uck w/ my roomies” day though (look up “I got shot… I got shot with a crossbow”) so many of our posts are like little celebrations to the chaotic nature of my home. We also take advantage of an everyday thing with our roomie but this day was super special and will continue to be every year!